Mirrors are usually surfaces that reflect light, which means photons bounce off of them. But a new kind of magnetic mirror can reflect magnetized atoms - one at a time. This atom mirror was built by researchers at the UK's University of Sheffield. 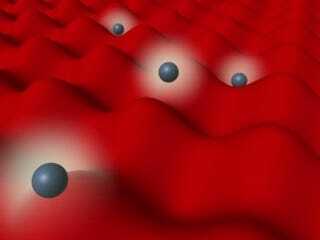 They created an array of tiny nanowires that, when properly activated, becomes solid and reflects the atoms. In order to do this, they placed magnetic fields perpendicular to the wires, which turns the mirror on. To switch the mirror off, they simply have to move the fields so that they're now parallel to the wires. Intriguingly, this construction is basically a "logic mirror" that exists in the binary configurations 0 or 1, depending on whether an atom is present. The researchers believe the magnetic mirror could be helpful in computing, perhaps even in devices that use atoms as qubits, the individual units of quantum information. Lead researcher Thomas Hayward explains where they're headed next with their research: "We are looking for ways to build magnetic systems that can manipulate atoms. By using soft ferromagnetic materials, in the form of nanostructures, we can manipulate the material properties and direct atoms. The next step is to drop a cloud of ultracold atoms on the mirror so that we can watch them bounce."